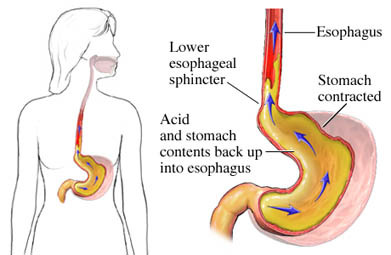 The esophagus is a tube that carries food from your mouth to your stomach. Barrett esophagus is a change to the cells of this tube. This change means there is a higher risk of cancer developing. Treatment can lower the risk or catch cancer early. The exact cause of Barrett esophagus is not known. Regular, long term damage and inflammation to the area may play a role. A back up of stomach acid into the tube is the most common cause of damage. This is also known as heartburn or gastroesophageal reflux disease (GERD). Barrett esophagus does not cause symptoms itself. The doctor will ask about your symptoms and past health. A physical exam will be done. The doctor may want to test for Barrett esophagus if you have a history of GERD. Biopsy—a sample of abnormal tissue is removed. It will be examined in a lab. This will show changes to the cells. There is a range of cell changes. High grade changes are at greater risk of cancer. Medicine may help to control reflux. The most common choice is proton pump inhibitors (PPIs). PPIs help control symptoms and slow or stop further damage. This surgery can help to control severe GERD. A part of the stomach is wrapped around the esophagus. It will help to keep stomach acid in the stomach. Part of the esophagus is removed. This may be needed for areas that have a very high risk of becoming cancer soon. The stomach may be pulled up or the area is replaced with a section of large intestine. Follow up tests will be done to check for any new changes. They may be needed every 3 months to 5 years. The rate of follow up will depend on the type of cells that are present. Not smoking. If you smoke, talk to your doctor about steps to help you quit. Raise the head of your bed onto 4 to 6 inch blocks. Avoid tight belts or waistbands. Avoid foods that cause heartburn. Alcohol, caffeine drinks, chocolate, and fatty foods can cause problems. Spicy foods or those with acid such as citrus or tomatoes can cause problems too. Do not eat or drink for 3 to 4 hours before you lie down or go to bed. Barrett esophagus. EBSCO DynaMed Plus website. Available at: http://www.dynamed.com/topics/dmp~AN~T115861/Barrett-esophagus . Updated August 2, 2017. Accessed April 4, 2018. Barrett's esophagus. National Institute of Diabetes and Digestive and Kidney Diseases website. Available at: https://www.niddk.nih.gov/health-information/digestive-diseases/barretts-esophagus. Accessed April 4, 2018. 11/30/2015 DynaMed's Systematic Literature Surveillance http://www.dynamed.com/topics/dmp~AN~T115861/Barrett-esophagus : Shaheen NJ, Falk GW, Iyer PG, Gerson LB. ACG clinical guideline: diagnosis and management of Barrett's esophagus. Am J Gastroenterol. 2016;111(1):30-50.